There’s a lot more to Owensboro than just mouthwatering, award-winning barbecue. Yes, the western Kentucky city is renowned for outstanding barbecue, but it also offers a beautiful riverfront, Kentucky’s only municipal ice arena, several museums and enough festivals to fulfill all your funnel cake cravings. It also is home to a police department committed to its mission of community partnership and leading with professionalism, honor and integrity. 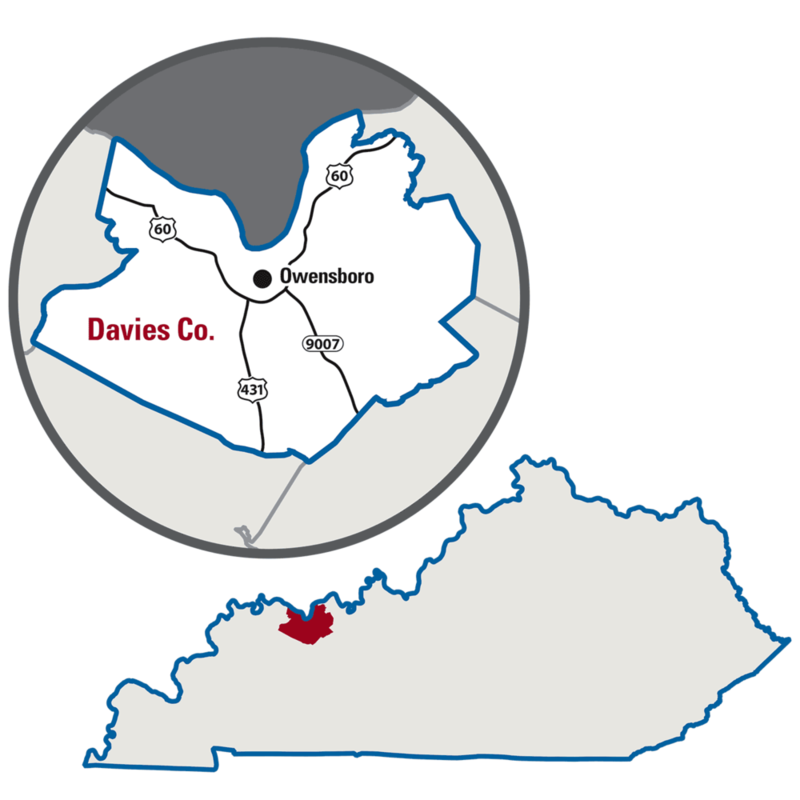 One of Kentucky’s larger agencies, the Owensboro Police Department employs 102 sworn officers and more than 40 civilian personnel. In 2017, officers responded to 40,722 calls for service and conducted 7,502 traffic stops in the community of more than 57,000 residents. The ranks are led by Chief Art Ealum, who began his career with the department in 1991 as a patrol officer after getting his feet wet as a volunteer reserve officer in Evansville, Ind. The chief said he didn’t have command staff aspirations when he began his career. Like many, he loved patrol work. As a probational rookie, Ealum earned a beat in one of Owensboro’s hot spots. About seven years in, Ealum was feeling the burnout of working that beat and applied for the Criminal Investigations Division. The captain in charge at the time knew Ealum wanted to work narcotics, but due to some shifting within the agency, he asked Ealum to work a general detective slot for about 30 days before he could move into narcotics. When the 30 days were over, Ealum said he requested to stay put. While Ealum said it was one of his favorite assignments, the promotional bug hit and he quickly began to climb the leadership ladder. Serving as a sergeant for a little more than a year before he was promoted to lieutenant, Ealum said he then went “kicking and screaming” into the department’s Professional Standards Unit, which handles all the agency’s internal affairs. “It turned out to be another great assignment because I realized I was getting to see another side and I was working to protect the integrity of the organization and ensuring people were abiding by policy and doing the right thing,” he said. Ealum continued rising through the ranks until finally he was named chief in 2011. Like Ealum, Owensboro officers have a multitude of choices when it comes to assignments. Officers can choose to join the department’s honor guard, Emergency Response Team, Hazardous Devices Unit or Street Crimes, for example. Owensboro Sgt. Courtney Yerington leads the agency’s Crime Prevention Unit (CPU), which specializes in community programs. As a high school student and again in college, Yerington interned with OPD, giving her both a foot in the door and a grasp of what policing her hometown entails. Today she spends most of her time grooming the next generation of OPD recruits through D.A.R.E., Citizens’ Police Academies, a summer camp and more. “We love being out in the community and letting them know we are here for them, that we’re here to serve them,” she said. The Citizens’ Police Academy (CPA) for adults is a longstanding OPD program, but last summer, the CPU created a junior CPA. Fifteen high school and college students joined the first class and their only request on the final review of the program was that they still wanted more. Yerington hopes that by giving attendees an early look at law enforcement, it will create interest and retention for OPD, just as it did for her. For the slightly younger residents, every summer the CPU takes boys who are going to be in fifth grade to Camp KOPS, which stands for Kids Obtaining Positive Structure. The children spend their time on team building and outdoor activities, such as fishing, archery, swimming and canoeing. They craft pinewood derby cars to race for the win at the end of the week. Five children from each city elementary school are chosen to attend. There are plenty of opportunities to learn during the week too, including first aid classes and demonstrations from the agency’s Hazardous Device, K-9 and Emergency Response units. During the school year, CPU teaches D.A.R.E and Character Counts programs to kindergarten through eighth graders. Yerington, who was named the 2017-2018 D.A.R.E. officer of the year, said she and her partner teach D.A.R.E. to odd grade levels and Character Counts to even grades to maintain a regular connection with students and avoid repeating curriculums. Officers throughout the department also are assigned to all Owensboro public schools as well as city Catholic schools through the Adopt-a-School program. The combination of these efforts provides a steady presence both during school day interactions with students and administrators and after hours checking buildings and surroundings to ensure their security. OPD Officer Jennifer Haynes is assigned to Owensboro Catholic Middle School, her self-proclaimed second home. During her shift, Haynes is dedicated to carving time out daily to visit the school, whether that is during the morning drop-off line or walking through to check doors and communicate with staff about any possible concerns. Haynes has provided her phone number to both teachers and administrators and built a relationship of trust wherein they know they can call her anytime to assist them with issues or provide resources. “It is significant to me because I have a child in middle school who has been through the lockdowns and lockouts before, and I know how important it is to feel safe when they see me coming through the school,” Haynes said. “Also, if – God forbid – anything does happen at the school, (responding officers) can come to me and ask about the building layout, how many students and teachers are there and if something seems out of place. Haynes is not unfamiliar with a crisis. Six weeks after completing her Police Training Officer program, she found herself at a stoplight behind the vehicle of an attempted kidnapping suspect. Haynes verified the license plate number on the sticky note where she had recorded it earlier when dispatch issued a BOLO. After requesting backup, Haynes attempted a traffic stop. But upon seeing Haynes’ cruiser behind him, the suspect fled, lost control of his vehicle and wrecked into a fence. The perpetrator spotted an ACME company van nearby that was warming up with keys in the ignition. Haynes quickly jumped clear of the oncoming vehicle and discharged her weapon twice, one round hitting a headlight and the other grazing the bottom of the van. The suspect fled the area and was captured about three blocks away. Following the incident, Haynes said she didn’t have a lot of anxiety initially. She took a little less than two weeks off. The first time she saw an ACME van driving in town she felt apprehensive. It wasn’t until her first traffic stop that she felt the effects of her post-traumatic stress. Haynes gave the driver a warning and got to an area where she could calm herself down. Her department had been very supportive, the chief and several officers offering a listening ear. About a week later, Haynes began having nightmares. Chief Ealum has been an ardent supporter of the Kentucky Post-Critical Incident Seminar, now having sent nine officers through the program since it began last year. Like he had those before her, Ealum suggested Haynes attend KYPCIS to seek help. “I had talked to a couple officers a little at a time on my terms, and of course, I chose bits and pieces of what I wanted to talk about,” Haynes said. “PCIS had me talk about my incident in its entirety. The feelings, the dreams, the anxiety – and all in a place where I knew nobody could say anything because it was covered confidentially. “Knowing other people had been through similar – or more serious – incidents and they were brave enough to talk about it brought that comfort to a level where I didn’t feel angry when I was telling my story,” she continued. A candidate for Eye Movement Desensitization and Reprocessing (EMDR) offered at KYPCIS, Haynes said she was able to seek treatment and no longer suffers from nightmares. “I don’t know what I would have done without (KYPCIS) training,” she said. “I will forever be indebted and grateful to this department and (KYPCIS team member) Travis Tennill. This is something every officer should go to. Everyone can benefit from the services they provide." When a former FBI and U.S. Secret Service certified latent fingerprint examiner offered to teach the Owensboro Police Department’s Evidence Collection Unit (ECU) what he knows in his free time made possible by his retirement, they seized the opportunity. Roughly 10 years since the department’s fingerprint system was put into place, the officers who operate the ECU – Jim Parham, Ken Bennett, Jeff Roby and reserve officer Dane Holder – still are amazed by the results they have seen. Owensboro’s ECU is responsible for all property and evidence custodial functions as well as forensic functions responding to major crime scenes, Parham said. Unit members process crime scenes, examine evidence and provide expert court testimony. Prior to obtaining the Automated Fingerprint Identification System (AFIS) and latent print training, Owensboro officers sometimes didn’t bother with fingerprinting scenes, Bennett said. It’s a misconception that fingerprinting is an old technology. After receiving a Kentucky Office of Homeland Security grant for the necessary tools to process latent prints and being mentored by latent print examiner Sam Durrett, Parham has himself become a certified latent print examiner and Bennett still is working toward earning his certification as well. Today, an ECU staff member can process a fingerprint, send it off through the Automated Fingerprint Identification System (AFIS) and have a response with 25 potential matches in a matter of minutes. The computer identifies legitimate characteristics of the submitted print and returns matches it thinks looks the closest. It then takes a human examiner to review them side by side to determine if a proper identification is there. “It’s a complicated process,” Parham said of reaching the point where they are able to assist in solving cases using the AFIS system. “We had a very experienced mentor, we have gone to training with different companies, there are proficiency tests that have to be maintained and there is a lot of scrutiny on forensic science right now. You have to be on top of the current research to be able to testify to the science and get it accepted in court. You can’t just phone it in. But that’s good for everybody – it does provide for stronger investigations. “We have had cases where there’s no suspect at all – and there wouldn’t have been a suspect had we not identified a latent print,” he continued.